almost done! 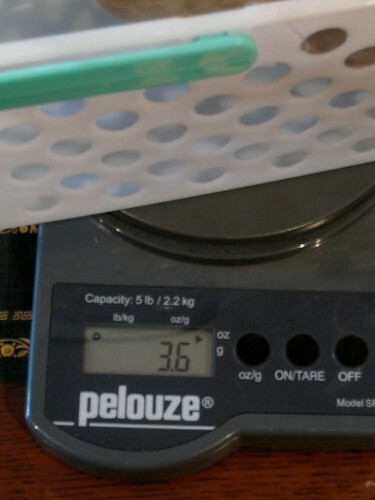 So I washed up the last few ounces, and got carding. I found it to be much more effective to card a rolag, spin it straight away, and then card some more. 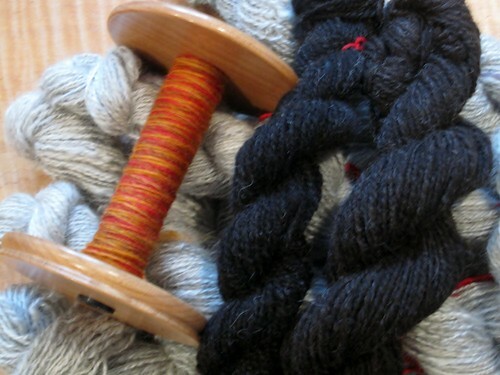 On Wednesday night I finished spinning the Gotland. 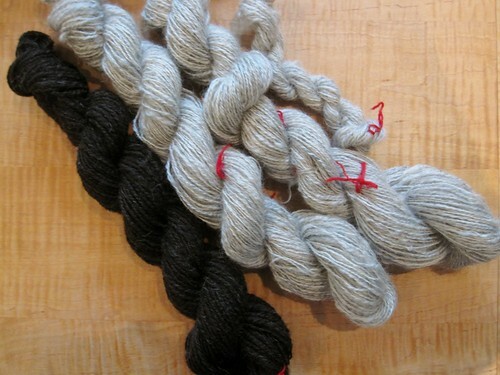 I only had 70 yds of the black Hebridean yarn, so I sorted through my bags of colored top that I'd bought, just to try out, and decided that the Black Welsh Mountain was the closest color match to the Hebridean. That got spun up on Thursday. Can you tell which is which? The Black Welsh Mountain is actually a dark brown, and when put next to the Hebridean, is noticeably lighter. The Hebridean is really, really black. I think that when I knit the sweater, I'll use the BWM for the hem and yoke colorwork, and the Hebridean for the cuffs. I think they'll be fine in isolation, but together the color difference will be noticeable. The final pile. 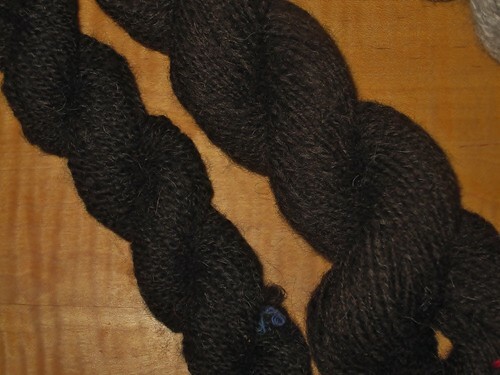 Yardage stats: 68 yds Hebridean, 115 yds Black Welsh Mountain (I have more of this top so if I run out, I can spin more), 1163 yds Gotland. 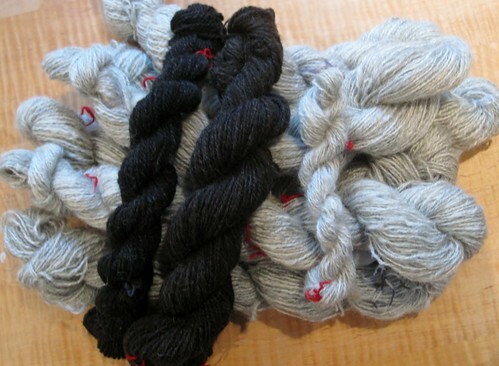 Total yardage needed: 1125-1270 yds grey, 180-205 yds black, depending on whether I want positive ease or not. Hmmmm...I think I'm going to knit the body up to the armholes, provisionally cast on the sleeve stitches, work the yoke, and see how much yarn I have left and knit the sleeves down until I run out. Hopefully that will work! In any event, it's a really good thing that I finished the spinning for this project on Thursday. Because you know what arrived on Friday? My new toy (and 40th birthday present to myself). 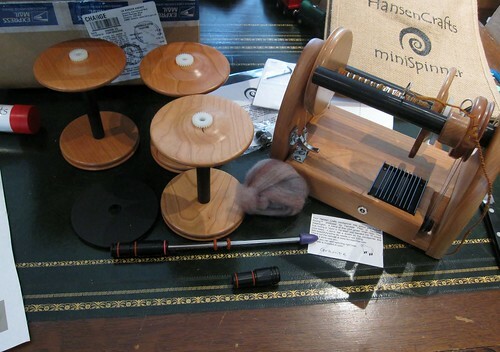 And since the Gotland/BWM spinning was done, I got to start playing straight away. I have since finished this BFL, and am working on some Wensleydale that is going to be a present for one of my P3 hostesses in a couple of weeks. It's taking some getting used to, but it sure is fun!